Sometimes a product comes along that captures the spirit of innovation so head-on it becomes an instant classic. 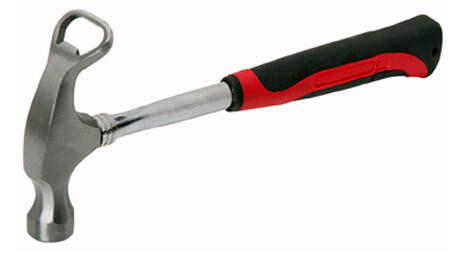 Toolmonger readers, I present to you — the Bottle Opener Hammer. Yes, nothing quite says, “I plan to go out there and do the bare minimum” like the Bottle Opener Hammer. Try as you like, this piece of out-of-the-box thinking is something you just won’t find anywhere else. Purpose built for not hammering nails — no joke, there’s a warning saying not to hammer with it — this hand tool goes above and beyond the call of thirsty workers everywhere. The good news is that you to can own this vital piece of shop gear for the get-them-while-you-can price of $2.87 from Harbor Freight. ‘Nuff said. Finally, a tool worthy of the hammer loop on my work pants. As long as no one looks too closely, they might think I’m actually working (they should know better). I had one of these, the head flew off while I was using it as a hammer. I know, it was a silly thing to do. Finally a perfect way to get “hammered”. They were selling these at Restoration Hardware (ahem) when I worked there back in High School and College. Best $10 ever spent on a gift for my Dad. Got one courtesy of LOML a few years ago. It’s too small to be used as anything other than a tack or brad hammer. I’ve used it a few times for tacks or brads but for the most part I use it to GET hammered. When all you have is a hammer, every problem looks like a beer.